Storytelling – and story-listening – is in our DNA. Facts just don’t stick with us like stories do. Our brains best connect bits of information when they arrive as a strong plot driven by emotions we all share. 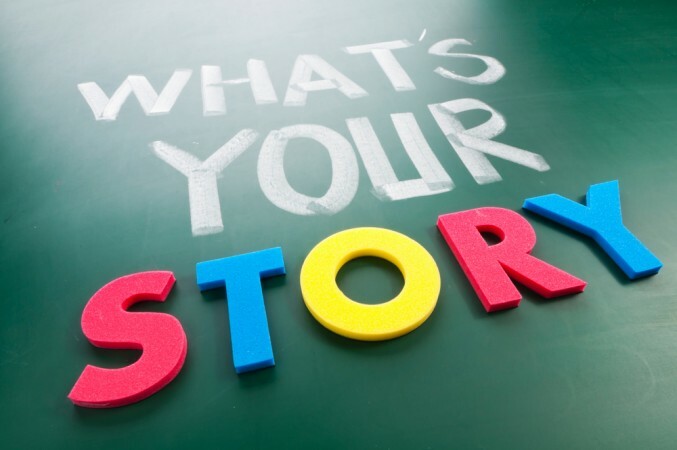 So, entrepreneur, what’s your story? Emotions? Plot? What’s that got to do with business? I’m not launching a Stephen King novel. Nope. You’re on a much more important mission. You want to do all that, right? A well-structured story gets you there fast. Your story’s plot isn’t an exhausting history. Or a fistful of data. It’s a simple, interesting tale that fires up story-loving brains. And it’s easier to structure than you might think. You’re unique; so is your business. But every great story – brand, book, movie, whatever – has a twist-and-turn plot structured with the same two words: but and therefore. Now let’s juice up the power. Neuroscience newsflash: decision-making isn’t logical; it’s emotional. Rational arguments may get your audience to nod. But if you want people to act – to buy from you, to partner with you, to be recommending you to their mates – your story has to connect with their gut feelings. Think back to when you first thought about creating your business. What emotions were spurring you to act? Get to the emotional core of why you’re doing what you’re doing. Your story likely involves many factors. Focus in on what your audience will relate to and what people gain from your business. Let’s hear some stories. Simple plot, emotional fuel, lives bettered. Go! Australia wants people to start new businesses. But did you know: a new business owner has to complete – at minimum – over 14 forms and make over 20 decisions before launching into the marketplace? We didn’t. Until we had to stomp that “welcome mat” for our start-ups. Aggravation 101. Days wasted navigating confusing systems. Never quite knowing if we’d actually ticked every box. There HAD to be a better way. There wasn’t. So we invented it. Veromo. With Veromo, you can launch your new business in one day, with one form. Simple. We’re committed to liberating entrepreneurs from all sorts of regulatory, operational and marketing drudgery. We want our customers to be free to do what they love: actually BUILDING their business. Did you spot the situation + but + therefore here? Did you share our rage at bureaucracy? Is it clear why Veromo exists and why we’re going to succeed? Problem/solution is a powerful format, but not the only one. The first time I tasted my Uncle Bob’s meat pies, I wanted to give one to anyone who was ever kind to me. Now I sell them to good people (and a few grumps) all over Sydney. There are so many people doing so many cool things with new drone technologies, I wanted to create a site for drone-obsessives like me to compare notes, share videos and connect with manufacturers of the latest and greatest. Ever since we crawled out of the swamp, people have used stories to share news, alert each other to dangers/opportunities and to connect with their tribe. Notice how energized you feel with every telling.